Excellent pub with a real fire, good food and friendly French staff and management. The Wainwright was very good and the Nutty Black was excellent too. Bar is very small and I imagine would be very crowded on a Sunny Saturday, but can't reccommend highly enough. Rooms are comfortable and spacious. Had booked accommodation here for a Saturday night. Arrived just before 6 to find a queue. Opened at 6. Small bar area and separate dining room.Beer garden at rear. V popular locally so booking recommended. As it was still warm enough we ate at outside tables. French chef who produces quality food with locally sourced meats. Thwaites beer in good condition. Large room with comfy bed and sofa. Separate shared bathroom ,large and clean. Only points were too much paint on window frames so wouldn't shut properly and lack of hot water for a short while. Occasional bus service to/from Settle. Lovely little pub. Small bar selling Thwaites beers.Good food served in the bar and dinning room, try the huge haddock and chips.Open fire and a very open welcome. 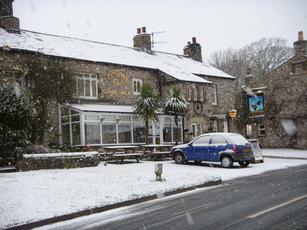 Small village pub with small bar area and separate dining/restaurant area. Garden at rear with aviary and children's play area, seating at front overlooking the green. Restricted parking. Choice of real ales. Restricted opening. Ideal base for walking in Crummackdale. Bit of a strange place as when I was there the landlord (?) closed up and locked the pub dead on 3 pm. and zoomed off in his car leaving people sitting outside with their drinks!